Some time ago good friends who are great travelers returned from a trip to Istanbul and couldn’t say enough wonderful things about the sites they’d seen, the delightful food they’d discovered, the ease of getting around this beautiful city. 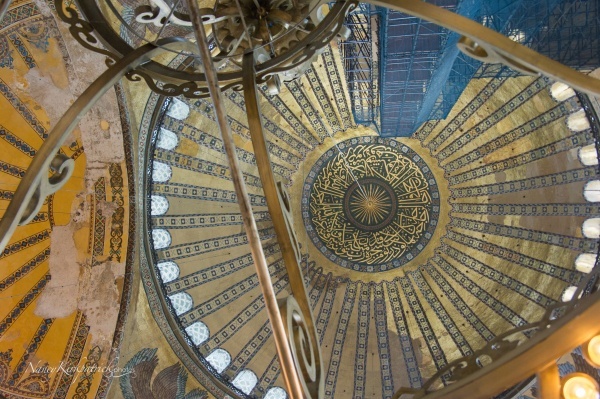 So with expectations high, Istanbul became a destination reality. Arriving from high above the city on a golden late afternoon, the natural beauty of this city in Turkey that straddles Europe and Asia across the Bosphorus Strait set the stage for what would be a memorable two days. 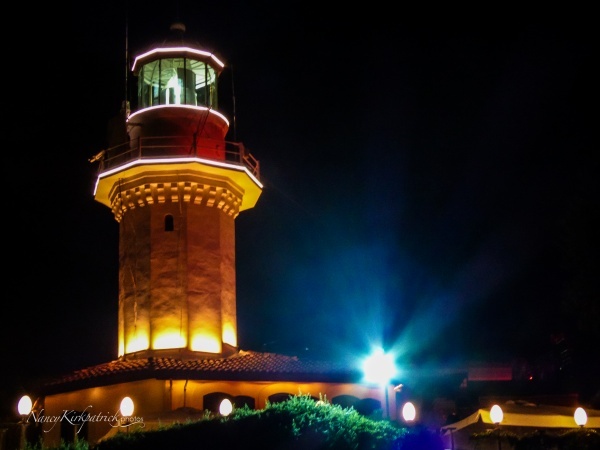 As the summer night fell gently into the sea, fuschia, teal and gold colored lights announced a nearby lighthouse, inviting an old fashioned stroll along the waterfront, complete with warm sea breezes adding to our delight at discovering this beautiful city. Because our visit occurred during the month-long Ramadan observance, dinner was delayed until after sundown when we then joined locals for our hotel’s evening feast (Iftar). What an experience to sample traditional favorites (fresh fruit, vegetables, halal meats, breads, cheeses, and sweets) while music added a festive air. Heading to the Old City by taxi the next morning, I marveled at the pristine conditions we passed through. 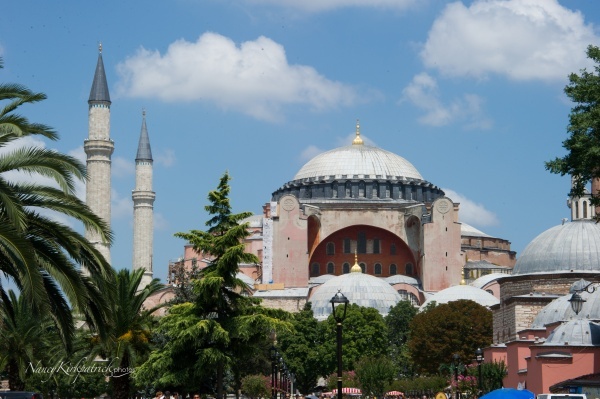 Istanbul certainly stands as a proud testament to the worlds’ greatest cultures, having been the capital of the Roman, Byzantine and Ottoman Empires. 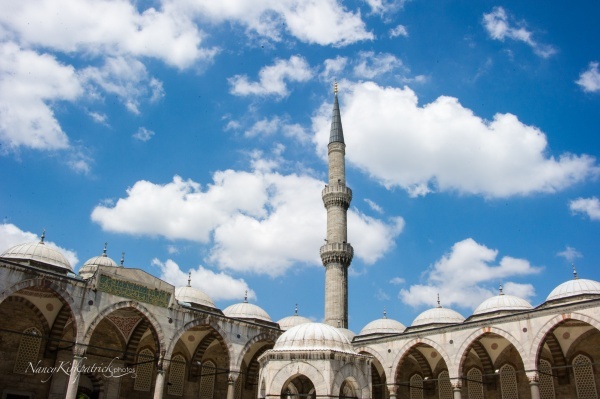 We decided first to see the Sultan Ahmet Mosque, popularly known as the Blue Mosque. 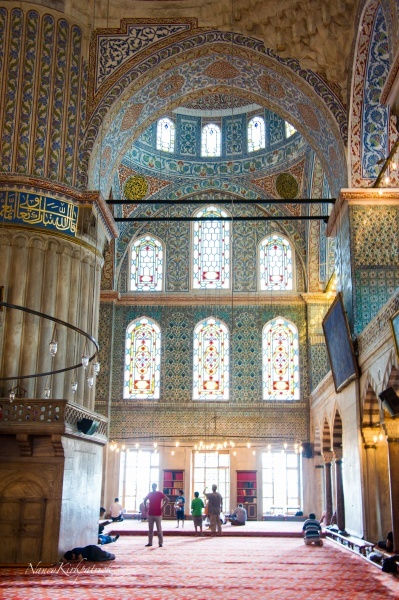 Built between 1609-1616 its architect, Mehmet Aga, decorated the interior befitting the jeweler he originally was. The 260 windows flood the interior space with light, which is covered by a dome 77 ‘ in diameter and 141’ high. And it is stunning. Out in the bright sunlight, we are delighted by colorful vendors. The Turkish ice cream kiosks are endlessly entertaining with the silly tricks played with ice cream on sticks twirled deftly just out of reach of eager hands. 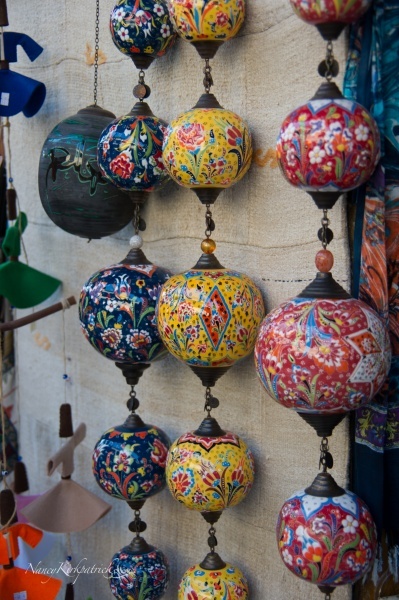 Porcelains, rugs, sultans hats, spices and endless colorful scarves and fabrics line the walkways. 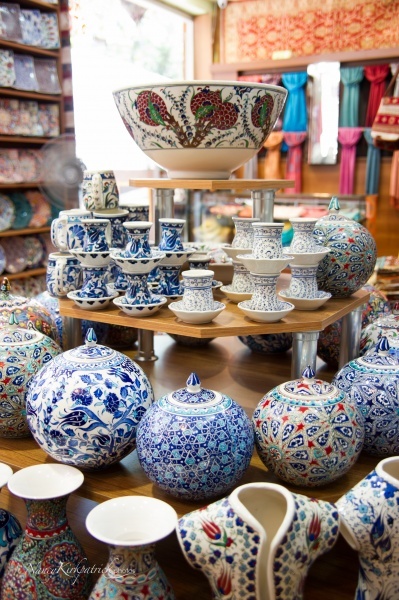 We stop to admire and are drawn into a shop for hot turkish tea while we shop. I marvel at man’s incredible will to achieve his dreams, to build something that will outlast him, to create from past marvels something new that was never achieved before. Experiencing one of the great cultural centers of the world, I cannot help but feel honored to be witness, once again, to the universal greatness of humanity.